An elephant never forgets, and we hope you won't forget this Elephant design. 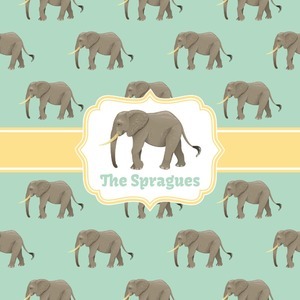 The design shows gray, tusked elephants on a mint background with a light yellow ribbons. The center has a label with an elephant and a space for text. Although shown in mint and yellow, the background and label color can be changed. Add a personal touch with a name or other text.